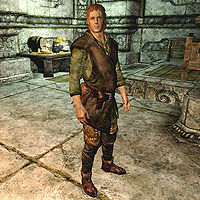 Rondach is a Breton citizen of Markarth and works in Understone Keep's kitchens. He seems to be terrified of his superior, Anton Virane. Rondach's sister Voada, is also Anton's assistant. Their father is Ainethach, the landlord of Karthwasten. He sleeps at one of the bedrolls in the kitchen from midnight to 6am, when he wakes up for a one-hour breakfast before starting his workday. He has one-hour meals at noon and 5pm. At 7pm his workday is over and he spends the rest of the day relaxing in the kitchen. Rondach wears a set of farm clothes and a pair of boots. He is equipped with an iron dagger and carries a selection of lower-class items and gold. He will express his fear of Anton, saying, "I have to work, or Anton will rip my head off." He will occasionally comment on Anton, saying, "Anton sure looks like he's from the Reach, but don't tell him that." or "Only reason Jarl keeps Anton on is because he cooks up a storm." This page was last modified on 18 October 2018, at 07:11.